Cape Town - Radamel Falcao scored a pair of penalties as Thierry Henry's Monaco won 2-0 at fellow strugglers Amiens to climb out of the bottom three in Ligue 1, on Tuesday. The Colombian had missed twice from the spot this season but calmly converted on 43 minutes at the Stade de la Licorne after Emil Krafth upended Benoit Badiashile. Amiens defender Bakaye Dibassy was sent off for catching the Monaco captain with a raised boot in the 90th minute, and Falcao wrapped up a second victory in three games with another penalty deep into stoppage time. Henry said he wasn't getting too carried away with his team's victory. "From our side of things in terms of how we played it wasn't extraordinary but we held on. 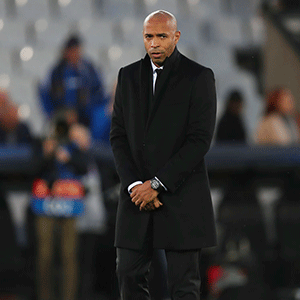 Fortunately Falcao was there when we needed him," Henry said. "We must not overreact, we need to continue to work and use the positive aspects of each match to inspire us," he added. The result provisionally bumped Henry's side up to 17th place above Dijon and Amiens on goal difference, confirming their recent upturn under the former France star in recent weeks. Nicolas Pepe hit his 10th goal of the season to send Lille back up to second following a 1-0 win over Montpellier, who dropped a spot to third. The Ivory Coast international swept home from a Jonathan Ikone cross with just six minutes gone as Lille snapped a four-match winless run. Nice extended their unbeaten run under Patrick Vieira to six games with a 0-0 draw at home to Angers, who saw goalkeeper Ludovic Butelle dismissed in the closing stages. Butelle's sending-off forced midfielder Baptiste Santamaria to take over the gloves in injury time with Angers having used all three of their substitutions. Paris Saint-Germain, 13 points clear at the top, will be without Neymar as they look to continue their undefeated record in Ligue 1 this season on Wednesday's trip to Strasbourg. The world's most expensive player came off early in the second half in Sunday's 2-2 draw at Bordeaux after hurting the same groin he injured playing for Brazil against Cameroon last month.